The stories behind the buildings, statues and other points of interest that make Manhattan fascinating. In 1887 the three story brick home at No. 116 Waverley Place had had a long string of upscale owners. But none were as memorable as Anne Charlotte Lynch who lived here in 1845. She helped set the future tone of Greenwich Village as a literary center with her weekly salons. Following the European trend, hers were reportedly the first in America. But when the children of John G. Warren, now deceased, sold the old home to James Cunningham in April 1887, its fate was sealed. Cunningham, who lived next door at No. 114 Waverley Place, was a well-known real estate developer. He spent $2,000 on the property for which he had much bigger plans. Waverley Place was named in 1833 in honor of Sir Walter Scott who had died the previous year. It was the result of a petition by Greenwich Village admirers of the author and his 1814 novel Waverley. By the time Cunningham purchased the old house, the second “e” was informally disappearing and by the first decade of the 20th century would be gone forever. In April 1891 architect Louis F. Heinecke filed plans for Cunningham’s project—a “five-story and basement brick and stone flat.” The projected cost of the apartment house was set at $20,000; or about $540,000 in 2016. At a time when many “flat buildings” for middle class residents were encrusted with a conglomeration of bearded faces, ornate terra cotta panels and other decorations, the upscale Cecelia was refined and restrained. The Romanesque Revival brownstone base featured a handsome portico upheld by polished marble columns and pilasters. A quaint iron railing gave the illusion of a balcony above. The openings of the second floor, trimmed in brownstone, were classically-inspired with Doric pilasters, entablatures and a single triangular pediment. Ornament in the higher stories included terra cotta panels and carved brownstone lintels. Above it all a complex, modillioned cornice announced “Cecelia,” not only the building’s name, but that of its owner, Cecelia Cunningham. Among the first residents was Patrick McCabe, an Irish immigrant who had made a name in New York politics in the past few decades. He had held many political offices including City Marshall, Excise Inspector and Chief Clerk of the nearby Jefferson Market Courthouse. McCabe suffered from diabetes and his condition became serious toward the end of 1893. The New York Times remarked “At one time Mr. McCabe weighed nearly 250 pounds, but he was brought down by his illness to nearly 125 pounds.” He died in his apartment in the Cecelia on Sunday night, March 18, 1894 and his funeral was held in St. Joseph’s Church on Sixth Avenue three days later. Another early resident was Dr. Dennis L. Shea. He was educated at New York University’s Medical School and worked at St. Vincent’s Hospital before opening his own practice. On Valentine’s Day 1899 the 34-year old married Anna J. Weeks. The newlyweds moved to a brick home at No. 151 West 10th Street where they had a daughter. Tragically, Dr. Shea contracted meningitis a little over a year after their marriage and he died on July 24, 1900. Another physician in the Cecelia was Dr. J. H. O’Connell. His medical acumen was well-respected and he was several times called upon by local officials. Such was the case in July 1897 when the new Convict Labor Law was enacted. The law replaced the former “forced labor” with “productive labor in the prisons”—the forerunner of prison programs like license plate making. Critics complained, somewhat surprisingly, that the new program resulted in insanity. “Since the convict labor law went into operation, causing much enforced idleness among the prisoners, there has been a significant change for the worse both in the physical and mental health of the convicts at the Kings County Penitentiary as well as in their general conduct,” reported The Sun on June 21. The newspaper said there “have been more attempts at suicide and more violent outbreaks” than in any previous years. Like Patrick McCabe, O’Connell attended St. Joseph’s Church. While Father Dennis P. O’Flynn was conducting the 10:00 mass on December 16, 1900, he noticed that John Kennedy was breathing heavily in the front pew. His head had fallen back and his face had lost its color. The 74-year old retired trucker lived on Morton Street with his wife and two daughters. His doctors warned him against excitement; but that morning he was afraid of being late for church and had scurried down Sixth Avenue. All the while the mass continued. At the end of the service Father O’Flynn announced to the congregation that Kennedy had died. James Cunningham seems to have overextended himself around this time. In February 1904 the Emigrant Industrial Savings Bank initiated foreclosure action against Cecelia Cunningham and later that year not only was the Cecelia sold at auction, but so were the Cunningham house at No. 114 and the house at No. 118, also owned by the couple. 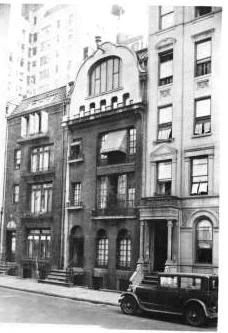 The respectable tenants of the Cecelia were no doubt shocked when the apartment of Thomas Butler was visited on April 8, 1905 by an undercover detective. Law enforcement was battling a rash of illegal gambling dens; among most popular being “handbook joints” where horse betting was carried on. The following day The Sun reported that Acting Inspector Hogan “turned up the collar of his overcoat and otherwise disguised himself as a race player went to a place where he suspected a handbook was being run at 116 Waverly place. He was admitted without suspicion, and he says that he got $5 down on a horse in the fifth race.” Thomas Butler went to jail. Dr. J. H. O’Connell was still in the building at the time. In the summer of 1906 Father O’Flynn was overcome by the heat while calling on a parishioner. “At first his condition was not regarded as serious, but later general debility set in and his condition became alarming,” reported the New-York Tribune on August 12. O’Connell attended his parish priest; and declared on August 11 that “he had little hope of his recovery.” Father O’Flynn was given last rights. At least two of the women living in the Cecelia added to the independent and forward-thinking reputation of Greenwich Village females. In 1909 Minnie Kaufman was attending New York University’s Law School; and sociologist Mabel Boyd was in the building for at least two years between 1914 and 1916. Both women had ventured into nearly men-only professions. In 1930 Mrs. George King lived in a fifth floor apartment here. Temporarily staying with her was her niece, the 30-year old former Ziegfeld star, Allyn King. She had gained prominence when she was 20 years old and understudied Ina Claire in the Follies. Three years later she became a star in her own right when she played in Ladies Night. Allyn apparently expected immediate results, for when she saw no visible weight loss in a few days, she resorted to reducing pills. Her mother found her a few days later unconscious in her apartment on East 86th Street. Nevertheless Allyn resumed her vocal training, taking two lessons a week. Her vocal coach thought she would be able to broadcast a short radio recital soon. The prediction proved overly-optimistic. Allyn King died in the hospital the following morning. Her funeral on April 1 was attended by more than 200 people, many of them well known names in the theater. The Missing Persons Bureau blanketed the Village and surrounding areas with missing posters and her photograph was published in the newspapers. Finally, on June 18, a restaurant owner recognized Louise from the newspaper photo. Patrolman Robert Gleason approached her and her older companion. After insisting they were Mr. and Mrs. Robert White; Louise finally confessed her identity when confronted with the photograph. She had met “Prince” Childe de Rohan d’Harcourt at the poetry party and for two weeks they had been living in cheap hotels and the apartments of friends. The 38-year old, of course, did not have a noble title; but he did have an extensive criminal record. The Cecelia survived the 20th century with little outward alteration. A most startling renovation came in 2014 when it was converted to a 10,200-square foot single family home, designed by architect Dirk Denison. With upscale amenities like a roof-top swimming pool, it was placed on the market in 2015 for $35 million. It became more affordable when the price tag was reduced to $26.5 million early in 2016. Tom- do you have a sense of what the original layout of the apartments were? The stair hall, of course, was on the left side above the entrance. There were most likely two apartments per floor with the living rooms facing the windows, front and rear. But that is merely conjecture based on normal flat floor plans. That interior is downright tragic. By the way, did the runaway girl marry the "count?" Apparently not. When Louise refused to press charges of "seduction" against him, authorities sent him to Ellis Island for detainment awaiting deportation proceedings. He was charged with "violation of immigration laws."